A friend gave me this terrific phrase that pretty much sums up my view of making wine - art, science, luck. It doesn't just have the right elements. It has them in order. Great wine is an expression of specific grapes, of a place and a season. It is an artistic expression, and not simply that of the winemaker. Wine as we know it is not natural without human intervention. Still, humans are a part of nature and our role in guiding grapes to reflect what we at least perceive to be their nature is fundamental to what's interesting and artful in wine. Anyone can ferment something and make it drinkable. I believe the art of making great wine is about helping the uniqueness of a specific lot of grapes become real and beautiful. Something you can smell and taste. Of course, there is science. We study the biology and chemistry of soil, plants and fruit in the vineyard. Then we take the grapes at harvest and analyze their components, perhaps intervening to preserve the integrity of what's there. We monitor sugar, acidity levels and temperature throughout fermentation, observing smells, tastes and textures along the way. For me, the goal of science is to understand what's present and what's happening, all with the intent of allowing what's there to best reveal itself in the finished wine. And there's luck. Luck implies something happening that won't usually happen, and great wine is undoubtedly the product of luck. Luck in the growing season and luck in the winery, where things that you've done before, perhaps after a season that might not have been entirely unprecedented, somehow delivers something truly exceptional. Doesn't this happen in so many walks of life? From sports championships to a great novel, how many times do people produce something extraordinary and spend the rest of their time trying to recapture that result? But luck has another side. My dad, like many dads I suppose, used to say that luck happened to people who worked hard. Luck in this way being fortune, something that might be repeatable with a certain diligence. I think of the best improvisational musicians. They study and practice, tune their instruments and set things just right, then let go and allow fortune to reveal something great. The result is usually not something anyone had in mind, which is the point, as if there's a combination of artistry in the musician and the music itself, so that the musician is channeling or funneling something more essential than he or she would have consciously delivered. How many times do we hear winemakers talk about talking great grapes and simply trying to not screw things up? It's really true. That's winemaking to me. You go into it looking for expression. That's the point. You are diligent about analysis and technique, with the goal of preserving that expression. You then let go to allow something greater than you to happen. 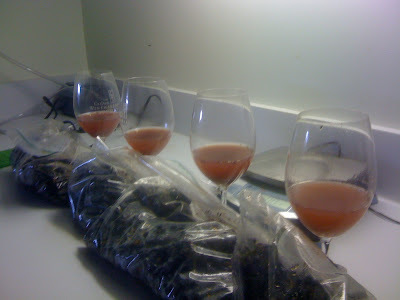 So, harvest 2010 has been about harvesting, sorting and destemming, adding some sulfur to preserve integrity, and largely letting the grapes ferment without interference. Each fermenter was mixed once, then left alone for a week or more until it became active, then monitored for a complete fermentation. The goal isn't to say this is the right or best way to make wine. Rather, to see if the result will be reflective of the grapes, their place and season. And perhaps something lucky, either chance or fortune, will come from it. At the least it should be unique. So far, I think it's a mix of both. 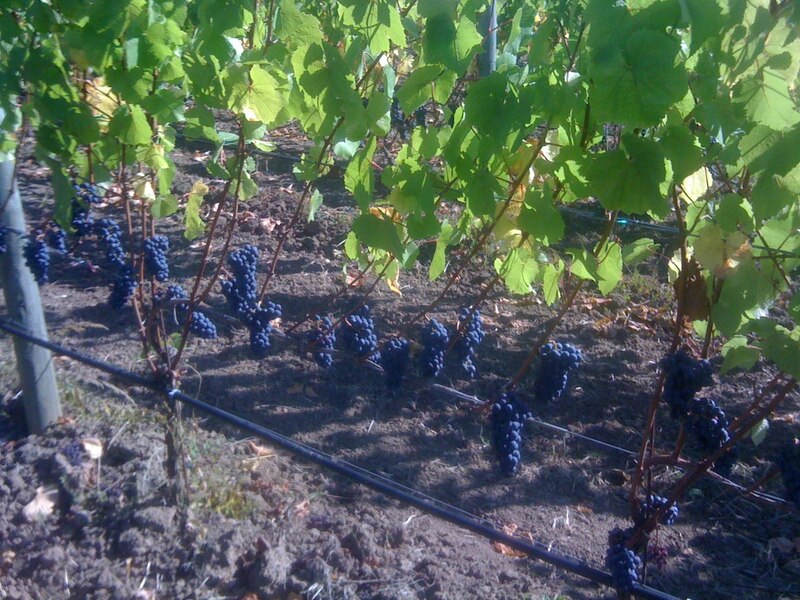 I'm excited for what harvest 2010 in the northern Willamette Valley is producing. Stay tuned as the new wines age through the winter and spring. I spent this glorious day at Medici Vineyard helping friends field sort a few tons of Pinot noir from 36 year old own-rooted Pommard clone vines. 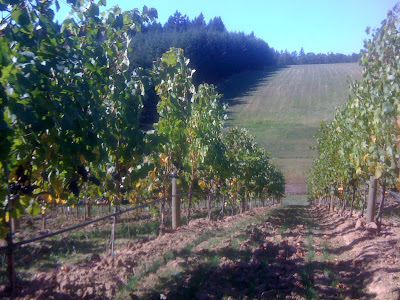 Medici is high up in the Chehalem Mountains, off Bell Road due north of Newberg. If you're in the area and see a steep vineyard high up on the hills, that's Medici. This shot is from the top of the vineyard, at 800 feet looking west to the Dundee Hills. It ended up around 70F with a light breeze, shirt sleeve weather in later October. Unbelievable. I think of today as a field trip, to taste and see grapes in a vineyard I've never before visited, then helping with the processing at a winery in the McMinnville wine ghetto. There's nothing like getting out of your cocoon to see how other people think about and work harvest. What did I learn? Nothing major, just little things about vine health, grape maturity, sorting technique and general approach to fermentation (hands off). The biggest thing might have been how comfortable I finally am with all the usual duties of bringing in and processing fruit. It's not rocket science, but there's a difference between following along and staying out of the way and knowing what needs to be done and when. I guess that's a long way of saying I actually helped out and it felt good, especially seeing friends get their first lot of grapes for a new project. Meanwhile, things are cooking back here in Portland. All of my own fruit is in and things look great. More on that soon. I'm late for an appointment with my dreams. Readers know I'm a sucker for a great deal, or at least the idea of a great deal. But really, what would you say if I told you I'd found a Barolo under $20? You'd dismiss me with a "stop buying your wine at Trader Joe's." Back away from some industrial shell of such a noble DOCG. And you'd likely be right. Trader Joe's is full of low budget and low value Amarone and Barbaresco, appellations that typically command high prices and promise incredible wine experiences. So how is this possible? Barolo, the king of nebbiolo from Italy's Piedmont region, for less that $20? That's a normal price for regional nebbiolo these days. How could you possibly get Barolo for such a price, much less something that's not only better than those nebbioli but worthy of the Barolo name much less any of your money? Enter the 2006 Reverdito Barolo, in the local Portland market from Zancanella Importing for around $19. Reverdito is a smaller producer of Dolcetto, Barbera and Nebbiolo from the town of La Morra. Usually their wines offer good value, with notable prices on their Codane and Moncucco Barolo in the $28 to $35 range, low for Barolo though perhaps because Zancanella imports the wines directly. Then I was in Vinopolis recently and saw the latest Barolo for just $18.99. I had to ask shop owner Dan about the wine. He said he believed Reverdito blended all their Barolo for this vintage together in one bottling, and priced it to move. If it were as good as basic regional nebbiolo I would be happy. But tonight with homemade pizza this wine is absolutely delicious. It's rustic but powerful, not lacking stuffing for nebbiolo's classic tannin and acidity. It's dark ruby colored but translucent, still traditional with lovely dried flower, spicy cherry and tar aroma. Perhaps there's some barrique aging here, but I find nothing overtly modern here. You won't get the finesse and elegance of top producers. You will get true Barolo character and depth for a lower price than I've seen in many, many years for real Barolo. The back label tells of the Reverdito vineyard holdings. Two acres of Dolcetto d'Alba, two of Barbera d'Alba, five of Lange Nebbiolo and eighteen acres of Barolo, all in the villages of La Morra and Serralunga d'Alba. This wouldn't matter if the wine was no good, but this is good wine, all from a very small area that I believe produces Italy's most exceptional wine. Wine like this won't make you forget the wines of Giacosa or Mascarello. However, this seems like an exceptional opportunity for authentic and delicious Barolo for the price of peanuts. For the record, Liner and Elsen also has this on the shelf and I imagine others in the area have it too. Anyone can order it from Zancanella, assuming it's still available. Barolo at this price won't last long. Got a report last night that our Ribbon Ridge site, Armstrong Vineyard, was closer than I expected to harvest. Grape sugars in the 23 range and acids in the 3.3 to 3.4 pH range, still very bright but the way I want them. I had to take the day off work and visit both of our sites, to see and taste things for myself. First stop, Zenith in the Eola-Amity Hills. 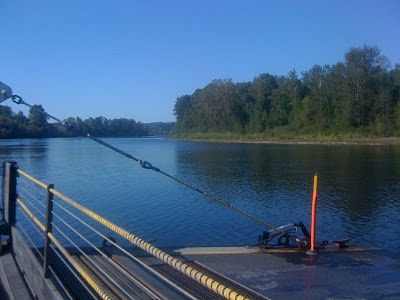 This is such a great site and I'm always happy taking the Wheatland Ferry across the Willamette to get there. 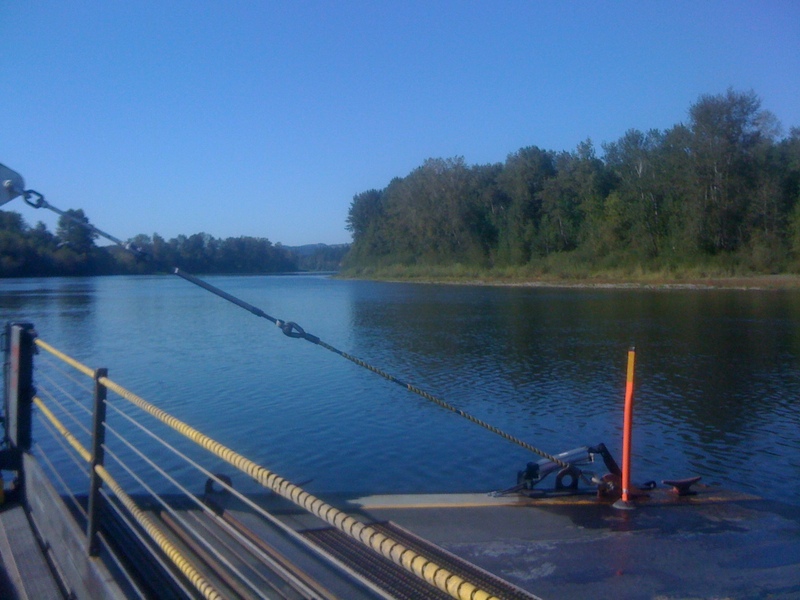 Without a bridge across the rive between Newberg and Salem, we take the old car ferry, turn off the engines and glide across the water for a few minutes. It's lovely. Then to Zenith to check out block 6-G, where I get Pommard clone Pinot noir. As I got to the ferry I received an email from vineyard owner Tim Ramey with tons of numbers for various blocks, including this one. Sugars were 21.3 and pH was a teeth-rattling 3.03. I walked the rows and took my own sample. Fruit tasted close but not quite there. Things look great so we should have no problem waiting another week, though as is the case everywhere this year, bird pressure is high. Lots of birds eating the ripening grapes. As an aside, is this the year of the critter? Last year the fruit crops from cherries to grapes were huge. This year, the mosquitoes were rampant, the raccoons wrecking havoc in my garden, the birds everywhere, at least it seems. Then up to Armstrong on Ribbon Ridge. Bird pressure is strong here too. Happily, we're about to pick. I took samples in all three of my blocks, clones 115, 667 and 777. Sugars had been reported in the 23 range, with pH in the 3.3 to 3.4 range. Flavors are generally great, with a few less ripe berries. That's fine. I'm not looking for huge ripeness and my readings below suggest plenty of sugar development. Acids remain bright though, which I'm excited about. Today got up to the low 80s around the northern Willamette Valley. What an absolutely gorgeous day, nearly 15F above the norm this time of year. Certainly our last day at 80 and we'll be happy to hit 70 a couple more times. The season is nearing the end, but the grapes will hang and continue to ripen even with weather in the 60s. What we don't need is a lot of rain. Some is on the way, but apparently good weather is on tap for next week. Back at the winery, the grapes samples I picked came out sweeter than expected. Pommard from Zenith was 22.1. 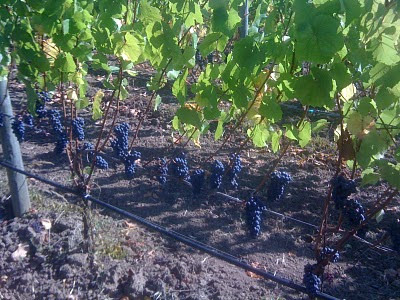 From Armstrong, the 115 came in at 24.5 brix, the 777 at 24.3, and 667 at 23.8. All at or even above what I'd hope (23.5 if you're wondering). Number don't tell the whole story. Still, things are clearly ready at Armstrong and I'm excited for the vintage. You can see the juice above. Things smell and taste great. I spent 30 hours this past weekend on the road to and from Seattle. The point was to connect with Vincent Wine Company wine buyers up that way, seeing old friends and meeting new ones. Along the way I took the opportunity to listen to some music on the drives and visit some wine shops, and one West Seattle music shop, and otherwise enjoy some solo time before the impending harvest. Out in West Seattle, I visited West Seattle Cellars, a tight little space packed with wine and people on a Saturday afternoon. Nice to see a shop that I'd heard of for many, many years when it was owned by internet wine guy Mattman. Didn't find anything I could live without, but up the street I did luck into exactly what I wanted, a used copy of Elvis Costello's All This Useless Beauty, which I have on vinyl and love but can't easily listen to in the car. Sorry old schoolers. I broke down. Then to Esquin where I found the first cache of 2005 Clos de la Coulee Serrant for less than $40. I guess Joly wine isn't the rage it used to be? Some other deals in this legendary Seattle store, but nothing I couldn't live without. I did grab a Joly. The up the road to the imposing Safeco Field and Qwest Field complex. And what did I see? Ha. Look closely. 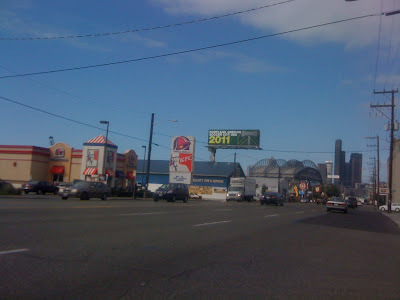 That says "Portland, Oregon...Soccer City USA...2011" which is when the Portland Timbers join MLS. Yup, right in the Sounders' grill. Love it. And what's this? I can't resist slumming it in the Grocery Outlet. Aside from some more than decent Neil Empson close outs from good Piemontese produces, there's a true GO oddity. The 2002 Jasper Hill Shiraz Georgia's Paddock for $25. Aussie cult wine, in the discount bin essentially. If you're in the area and into that kind of thing, that's a steal. Jasper Hill is one of the great Aussie producers. I grabbed one just to check it out. Then up to Seattle Wine Storage to drop a magnum for a customer. The guy working there finds out I'm a "winemaker" and thrusts a glass of mystery wine in my face. What is it, he asks. It's hard to read, but I get to gamay. Yes. Beaujolais. Yes. Morgon. Yes. Turns out it's the 2009 Brun Morgon, and he also has the 2009 Brun Brouilly. Both excellent and probably steals for what they cost, but they came from out of state. This guy has a bad impression of the local wine market, for things like this anyway. Fair enough. I'm buying Aussie shiraz, ferchrissakes. My drops done for today, I stop by Champion Wine to see this Euro-centric shop. It's a little warm inside, as I'd read online. But the selection is nice and I find a bottle of Marchesi di Gresy Barbaresco Martinenga Camp Gros for a nice price and buy it. Meanwhile I talk with the owner about my project and maybe plant the seed of a future buyer. We'll see. Then I head down to Pike Place to Pike and Western. Cool to see some Oregon brethren represented but I'm more taken with the latest issue of the Oregon Wine Press that somehow is all over Seattle already. My guy Francois is on the cover. Could have been me. They wanted to feature home winemakers and I was set to be part of the story, but I'm commercial now, so they asked if I knew anyone with a photogenic set up. I know Francois, and there he is on the cover of the October issue. Nice job. Cool to see Vincent Wine Company written up on page 12 though. Check it out. Francois, Jean-Jacques from Pike and Western says hello. Hope to be on the shelf here on day. Then to the flying fish people in the market. Why? I don't know. They just throw fish and I think it must hurt the quality of the meat, no? I guess I can't help being a tourist. Great old friends put me up for the night, much to my wife and children's chagrin. They would have liked to be there with me. Next time. There will be a next time. Late the next morning I set off to lunch with Thad Westhusing of the Beyond the Bottle blog. Thad and his family were terrific hosts for a lovely lunch featuring delicious 2006 Roulot Meursault and a modest bottle of my 2009 Eola-Amity Pinot Noir. The Meursault was excellent, all sea shells and lemons and nerve. My wine was showing nicely, if I may say that. Fragrant, red fruited and spicy, but not wood spicy. Honestly, this was the best showing it's had since bottling. The wine is pretty nice, I won't deny. We said goodbye with talk of connecting down here during harvest, which would be excellent. Thad, I'm holding you to that. Then I drove east to the burbs across Lake Washington, for some deliveries and a visit to Pete's Wine Cellar in Bellevue. Honestly, not my favorite spot though they had more of that Coulee Serrant for even less than Esquin. I leave without buying, which is good because the point of the trip wasn't to buy wine. No, it was to see the city and its people, then head south to home with the sounds of Chavez Ravine in my ears, long shadows and fading cottonwoods. It's October, we're not yet picking grapes, I'm roadtripping and everything's good.